Digging for a first draft. I’ve watched quite a lot of the Chelsea flower show coverage this week. I love it. I grew up in a house where there are always flowers, with a garden that’s always colourful and welcoming. My grandparents’ house was the same too – my grandad was a wonderful gardener. I think growing up around lovely gardens filled with beautiful flowers has definitely instilled that same love in me and so things like a week full of programmes from Chelsea makes me incredibly happy. Watching the coverage I was interested to listen to the gardeners behind the stunning show gardens talk about the process. I was particularly interested to hear Tracy Foster, the creator of the Welcome to Yorkshire garden, talk about there being a point where the garden all seemed awful but then by carrying on bit by bit it all fell into place and took shape. I think this rings true for a lot of creative things. I certainly think it applies for writing. Or at the very least I hope it does. I’m currently at that stage with my first draft. It’s spiralled away from me more than a little and I’m trying to work out how to tame it and get it back under control. I feel encouraged by the idea that this might just be the stage I’m at and that if I just keep going it’s going to fall in place and I’ll end up with something vaguely coherent. I may not end up with a beautiful garden filled with colourful flowers at the end, but I think the sense of achievement of being able to write The End will be just as welcome a reward. I have, like in many previous years, decided to do NaNoWriMo. The book I’m going to be working on through November is one that brings together elements I’ve been planning for a long time – characters and scenes that have been in my thoughts and notebooks for months and in some cases years. I’m feeling ready to write and so NaNoWriMo feels like the perfect time to get started. The idea of getting 50,000 words written feels daunting, particularly when I worked out I’m going to be away from home for 10 of the 30 days on November. I’ve decided therefore to have a personal goal separate to the NaNo total – if I get to the end of the month and have written 1,000 words every day I will have established an excellent writing habit and I’ll have the first 30,000 words of my novel. I think this is a great goal, and while I still will be aiming for the full 50K I know I will feel like I’ve achieved something if I hit that personal goal. Regardless of whether I end the month with 30,000, 50,000 or something in between I definitely won’t be finishing the month with a finished first draft. I think it’s going to probably take at least December and January to get a full first draft. I’m using this first draft to explore my story and my characters and work out exactly what it is they have to say. I know where they’re starting, I know where they’re going to end up and I know a few of the things they’re going to be doing along the way. The rest of it I look forward to discovering as I write. I’m trying at the moment to work out the sort of blogger I want to be here. The process of dividing my blog into two hasn’t gone exactly the way I’d expected it to, though I’m starting to see some real progress with Juniper’s Jungle and now feel I can figure here out better. I’m not sure I entirely agree with this, the first part I think yes absolutely. The latter part, well I’m not so sure. There’s certainly much more immediate discussion going on, but I know I still love to read longer, more detailed posts than Twitter or Instagram can ever convey. There are some things that blogging still does that I’m not sure anywhere else fully replicates. Tumblr is probably the one possible grey area, I personally tend to follow picture heavy Tumblr accounts on Tumblr itself and more traditional blog style Tumblrs in my Feedly (though of course still make sure I go and hit that heart button on the posts I’m loving). The problem is, I’ve been reading the majority of the blogs I read for a long time now. Some are no longer updated or if they are posts come once in a blue moon. Some are just no longer relevant to my life or interests and I find myself hitting the mark as read button more often than not. Then there are those blogs I look forward to every time I open my Feedly account. I’ve recently added a handful of crafty bloggers and can already feel my enthusiasm for blogging returning. I want to shake things up further, I want to add some new feeds and discover some new bloggers and that’s where I want your recommendations please. Who are the bloggers you look forward to seeing updates from? Please send me all of your recommendations – they don’t need to update daily or even weekly, just somewhat regularly and with interesting posts when they do. I’m not too fussy about subject matter either, they don’t have to be book bloggers or craft bloggers, just great bloggers please. I’ve been sitting on this blogpost for a very long time. Months and months in fact. Which in itself is pretty relevant to the subject matter of it. 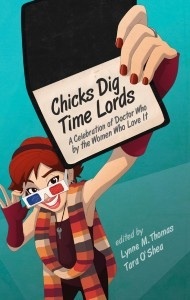 When I first heard about the book Chicks Dig Time Lords: A Celebration of Doctor Who by the Women Who Love It I have to admit I was puzzled by it. The title seemed to sum me up, I am after all a female fan of Doctor Who, but I didn’t really understand why the book was necessary. I don’t watch and enjoy Doctor Who or any of the other geeky or sporty things I like differently because I’m female, so why was it necessary to have a book about being a female fan? It was released and I heard positive things about the book but remained bemused. Then the nominations for the 2011 Hugo Awards were announced and Chicks Dig Time Lords was nominated in the Best Related Work category, and went on to win it. I decided I probably needed to give the book a go to see if I could work out why it was so highly regarded, bought a copy of it and put it on my bookshelf. Roll on spring 2013, my understanding of a lot of things had changed and my eyes had become opened to many new things (the internet is a wonderful educator). For reasons I absolutely do not remember I picked up my copy of Chicks Dig Time Lords and started to read the first essay. I read a handful of essays on my first sitting, and then over the next few months read the whole book an essay or two at a time – wanting to spread them out and give myself time to think about what they’d had to say. I was so very wrong in my first assessment of the book. I completely misinterpreted what the book was about and why it existed. The book isn’t a collection of essays about being a female Whovian, it’s a collection of essays by and about Whovians who happen to be females. And that is such an important distinction, one I needed time and learning to be able to spot, let alone understand. For all manner of geeky things there are a range of publications both print and digital that give fans a voice. I’m aware that whilst these publications exist women’s contributions are generally less common than men’s. That is what this book has done – it’s given a safe space for women to share their thoughts and opinions. I do think the balance has started to shift a little since the book was published in 2009, but there’s still such a very long way to go. As a female geek and sports fan I have always known that my voice is a quiet, frequently unheard and sometimes unwelcome one. My presence in both arenas has not been without its difficulties, my gender has time and again gone against me – from dismissive comments assuming the nature of my interest (apparently it’s all about the hot men) to suggestions that my knowledge needed to be tested to ensure I did genuinely belong there. My stories are sadly common amongst female fans, and I count myself lucky (and isn’t that in itself a sad state of affairs) that my experiences whilst irritating, patronising and downright unreasonable are firmly at the very mild end of the scale of the abuse experienced by other women. I have plenty of thoughts and opinions on the things I am passionate about. I shy away from sharing them publicly, particularly on my blog. There have been odd posts over the years, but far too many times there have been little voices telling me I don’t know enough, don’t have the background, don’t belong, shouldn’t be writing about that particular topic. And so I haven’t. This is the year I’m going to make a change. I have this space all of my own and I’m going to use it to be me. I’m going to write posts about things I love and care about, and actually hit the publish button. I’m going to write more posts about the random thoughts that often fill my brain, things that leave me pondering but I convince myself no one else could possibly care about. One of my concerns about writing about these things is that I won’t be any good at it – but as I tell my Beaver Scouts the only way to get better at something is to practice. I think it’s about time I took my own advice. I’m going to ignore the voice in my head that comes up with all the reasons why I shouldn’t, I’m going to stop caring about the fact I’m a girl, stop caring about the fact I might get something a bit wrong, and I’m going to take the leap and just get on with it. My blog, my thoughts, and there’s no one who can tell me what I can and can’t do.